The new Chinese Telephone Exchange is open and ready for business, after months of preparation. The exchange differs from all others in this city or in the world in that it is gorgeous with Oriental beauty and a marvel of luxurious good taste and splendor. The telephone company has made it a point to make the new exchange one of the show places in Chinatown. It has spared no expense to obtain this result, and Chief Engineer Cantin, under whose direction the work was done, feels justly proud of the results of his labors. The new exchange is in the three-story building at 743 Washington street. The first floor is occupied by a store, which has been refitted and decorated by its owners to be in accord with the remainder of the building. The entrance to the exchange is up a long flight of narrow stairs, at the head of which is a gayly decorated sign in Chinese letters announcing the presence of the telephone, which, strangely enough, is one of the most popular of the American inventions among the Chinese. On entering the ante-room one is met by smiling and bowing functionary, whose sole duty it is to make visitors welcome. Close by the door is a richly carved teakwood table, on which are kept tobacco and cigarettes and a nest of tea bowls while in a silk-covered caddy rests a large teapot, which is always kept filled with tea of a good quality. Tea and tobacco are always served to visitors, a compliment of hospitality which no Chinese business transaction is complete. At the extreme end of this room on an altar of considerable size and great richness, a richness of gold and silver and red lacquer, rests a joss whose special duty is to guard and care for the interests of those who send speech over wires. To many of the Chinese the telephone still holds, to a certain degree, its qualities of the supernatural, and the presence of a joss is not a luxury, but a prime necessity. Before going into the telephone-room itself a brief inspection of the rear of the reception-room is not without interest. In the extreme rear is a kitchen, small but neat and complete. There is an equally diminutive dining room, and likewise a bedroom, where Loo Kum Shu, the manager of the exchange, lives with his assistants. They are always on duty and the exchange is never closed from years end to years end. The front room, in which is placed the switchboard, is the most attractive feature of the place. It is gayly decorated with dragons and serpents of brilliant hue; there are rare lanterns hanging from the ceiling, in which electric lights have been placed, making a contrast of modernity and antiquity. The walls are hung with banners in red and yellow and gold. 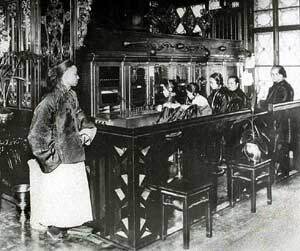 Along one side of the room is a row of teakwood chairs with cushions of silk, while near the switchboard are the small black stools which are to be seen all over the Chinese quarter. The switchboard itself is exactly like those in the other exchanges of the city, except that the operatives are men and Chinese. They used the same cry of hello in answer to a calla pleasant tone, cheerful and good-humored. The work of the exchange would drive an American operator insane. For, in addition to the 255 numbers on the exchange, there are at least 125 telephones which are either in Chinese lodging-houses or in clubs. The operatives have nearly 1500 names to remember, together with their owners place of residence. For example, Woo Kee rings his telephone and says he wants to talk to Chung Hi Kin. He gives no number, for Chung lives in some big tenement and has no telephone number. It is the duty of the operative [the telephone operator] to remember all these names, and it is claimed he does so without effort. The Chinese telephone company has been in existence since 1887 and has slowly made its way from place to place as its increasing business made larger quarters necessary. Mr. Loo Kum Shu has been manager for the past eight years. He speaks English without a trace of accent and is a man of great intelligence. He is very proud of his new quarters and never tires of showing visitors around the place. The telephone, he said recently, is an important factor of life in Chinatown. The Chinese use it a great deal and often transact very important business over the wire. For this reason we have no party wires, but each number has its own wire. If this were not the case we could not get any of the Chinese to use the phones under any circumstances. As it is, however, they use them all the time. The Chinese telephone company was to put in girl operators when the exchange was refitted, and doubtless it will be done eventually. The company prefers women operators for many reasons, chiefly on account of good temper. But when the company found that girls would be unobtainable unless they were purchased outright, and that it would be necessary to keep a platoon of armed men to guard them, to say nothing of an official chaperon to look after the proprieties, the idea of girl operators was abandoned.